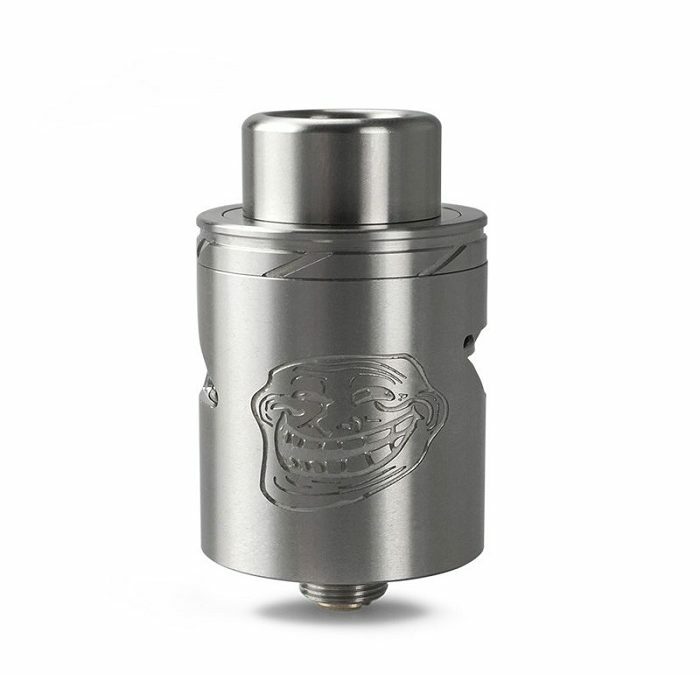 Wotofo made the original Troll RDA and it was very popular with DIY’ers. The Troll V2 is the latest addition to this line and promises to be even better. This version has a velocity-style deck, deep juice well and improved airflow options. If you like to build your own coils you’ll love the nice big build deck. It’s no secret that I love RDAs. I started preferring RDAs over tanks because I hate the leaking that goes with tanks more often than not. I tested this RDA with a couple different builds and it performs really well. It has massive airflow holes, which is good for vapor production, but a little too much for me personally. I closed them down about halfway and still, it worked like a dream. 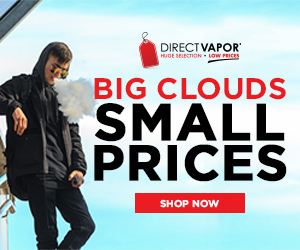 Big clouds of vapor and no burning or dry hits. The Troll V2 RDA is constructed from 304 stainless steel and is 24mm tall by 22mm wide. The airflow control for this device has two options: one is horizontal and the other is slanted. You can change the airflow by turning the top cap in either direction. It has a velocity-style, two post deck with large holes for leads to accommodate thicker wires as in Clapton and parallel builds. Rather than having the familiar 3 or 4 post design, it has just two posts on a velocity-style deck. The juice well is very deep so you don’t have to worry about keeping your wicks shorter, there is plenty of room on this deck to build on. The post holes are large enough to fit thicker wires and the grub screws fit nice and tight. There is an included tool to help you tighten them once you have your build in place. The only downside to this deck is that there is no option for a single coil build. The juice well for this RDA is 10mm deep. It holds a lot of juice and is wicks it quite well. I like to keep my wicks a bit long and fill up all the empty space with cotton so I can fill it more and drip less often. I can fit roughly 2 mils of juice on dry cotton this way. It evens out to about 1 ½ mils once the cotton has absorbed the juice for a second or third time. It is very durable but using the black version that I got, it did get a little scraped on the inside from removing and replacing the cap a few ties. The O-rings make for a tight fit and I found that putting a little juice on them before replacing the cap helps make it easier to pull off the next time. It is very simple to use once you have your build and wicks in place. Just drip the juice onto your cotton until saturated and vape. That is all there is to it. Placing your build is the hardest part of the whole thing. I like the vapor production of this RDA. The airflow is a little too wide-open for me, but if you like an airy draw, you’ll love it. Even closed down half-way the clouds were still huge by my standards. I had no issues with it whatsoever. I put in my build, wicked it, juiced it and vaped away. Really easy to use. I did not experience any issues with leaking at all. Everything fits together very snugly so there is no leaking around the base. The only leaking that might occur is if there is a lot of juice in the well and you lay it down on its side since the airflow holes are closer to the top. Cloud production on the Troll V2 is great. Big, fluffy clouds of vapor with wide-open airflow. I’m not a person with a lot of lung capacity, but if you are you could easily fog up the room. I keep mine open halfway and it still produces a lot of vapor. I used a black cherry-flavored e-liquid with this RDA and the flavor was right on point. The deep, richness and sweetness of the black cherry came through very well. – I personally think the airflow holes are a little too big, but that is part of what makes it work so well. This won’t be a con for some. This RDA is priced between $16.95 and $20.95, depending on the retailers you shop with. This is a well-performing device for the price and it is definitely a good deal for less than $25. If you’re a fan of RDAs and velocity-style build decks, I definitely recommend you to get this one. The deck is easy to build on and there is plenty of room for wicking without having to stuff them into the base. And it vapes great like all the best RDAs that have come along so far. And the price is great for such a well-performing device.